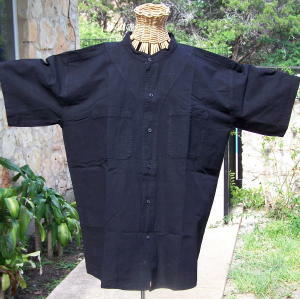 This terrific oversized shirt has a slightly oriental look, with buttons off-set to give it the feel of a tunic, but with big sleeves and two pockets for real comfort. It buttons down the front, so it can be worn closed at the top with a great necklace, or open for a walk on the beach. Bust 44" Opens to 48"
Hips 46" Opens to 50"
Bust 46" Opens to 50"
Hips 48" Opens to 52"
Bust 48" Opens to 50"
Hips 50" Opens to 54"
A single item shipped for $ 6.45 through USPO Priority Mail Envelope. into a medium Priority Box for $ 13.45.